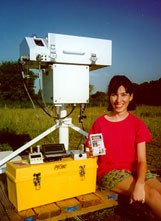 Vicki Mims measured ozone and UV-B with this EPA Brewer spectrophotometer during the summer of 1995. Vicki even measured the ozone layer at night by allowing the Brewer to observe the Moon instead of the Sun. Vicki is holding a miniature ozone instrument developed by her father, Forrest Mims.